Rare boxed version of the Canadian exclusive (Parkdale Novelty) Catapult, Horse and Wagon set. The box features the same artwork as the US version (sold sans the horse) but is much longer, features bilingual packaging (still the law in Canada) and a notification on how this set was made exclusively for Parkdale Novelty (and offered exclusively for Sears Canada). Cipsa sold the set as well in Mexico but the packaging is much different. Horse from the Mexican/Canadian Catapult & Wagon & Horse set. (Courtesy of ABMAC) Horse's hooves have ball bearings in them so it glides. 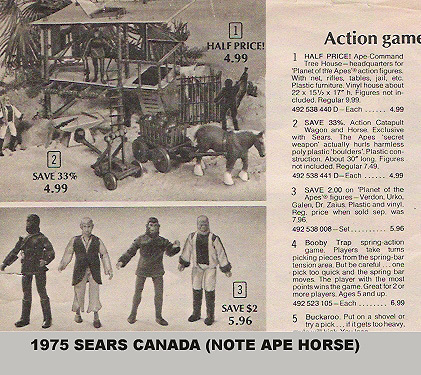 The Canadian Exclusive Horse, Wagon and Catapult set from the 1975 Sears Canada Catalog, for more on this check out the Mego Christmas Catalog Section of the Museum.